Luke Bomberger graciously shared his seagoing cowboy stories with me in July 2004. When 17-year-old Luke Bomberger of Mt. Joy, Pennsylvania, set sail for Greece on the S. S. Charles W. Wooster on August 15, 1945, he had no idea his expected two-month adventure would last twenty-one months. The Charles Wooster was only the seventh livestock ship to leave the United States. It carried 335 horses and the first Mennonites to sign up for the program. As all of the seagoing cowboys were required to do, these men had to join the Merchant Marine to be able to legally work on a merchant ship. Luke explores the Acropolis in Athens, Greece, with crew members of the S. S. Charles W. Wooster, 1945. Photo courtesy of Wilbur Layman. In line with his Mennonite upbringing, Luke had registered with his draft board as a conscientious objector. He turned 18 while he was at sea on the Charles Wooster, and his draft board came calling. When his parents told the board where he was and what he was doing, the board said he should keep on doing it for his service. His Merchant Marine status was his ticket to a tour of duty. Luke, top left, enjoyed life-long friendships with some of these crew mates of the S. S. Norwalk Victory, Feb. 1946. Photo courtesy of Elmer Bowers. Luke made nine trips before his discharge on April 25, 1947. He is likely the only seagoing cowboy who received a letter from President Harry Truman, “To you who answered the call of your country and served in its Merchant Marine to bring about the total defeat of the enemy, I extend the heartfelt thanks of the Nation….” He also received a “Certificate of Substantially Continuous Service in the United States Merchant Marine” from the United States Maritime Commission. Hiking with crew mates outside Trieste, Italy, February 1946. Photo credit: Elmer Bowers. Luke’s nine trips took him across the Atlantic Ocean sixteen times and across the Pacific twice. He traveled on eight different ships that took him to Greece, Poland, Italy, Germany, the Island of Crete, and China. He proved himself a worthy sailor on his first trip when he was hired as a “Wiper” for the return stretch to fill in for a regular crewman who had to stay behind in Greece. At the young age of 18, he became a cowboy foreman on his fifth trip and served in that capacity at least twice more. Cleaning stalls on the way to China aboard the S. S. Boulder Victory. Photo credit: Eugene Souder. All was not smooth sailing for this young man, though. Close encounters with mines floating in the water on a couple of his ships, a fire in the engine room on another, a fall in which he broke his hand, and a horse bite that left a lifelong scar on his back added drama to some of his trips. His scariest moment, however, was aboard an older merchant ship, the S. S. Mexican, on his second trip. He was serving as night watchman, making his rounds to check on the animals. After one of his hourly reports to the bridge, his foot slipped coming down a rain-slicked ladder and he shot across the deck on his back right towards an opening on the side of the ship. All that saved him from disappearing into the dark Atlantic night was a narrow lip of metal at the opening that caught his foot and stopped his slide. He was grateful to be alive, cracked ribs and all. Luke says his trips made him more aware of persons of other countries and their needs, which influenced his family’s hosting of international exchange visitors and students through the years. A heifer comes on board the S,S, Charles W. Wooster in January 1946 to begin its journey to Czechoslovakia. Photo credit: Christian Kennel. 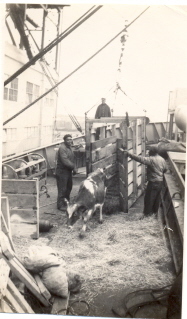 January 7, 1946, the S.S. Charles W. Wooster, left Baltimore, Maryland, with 325 heifers on board. The cattle were on their way to help families in Czechoslovakia recover from the trauma of World War II. 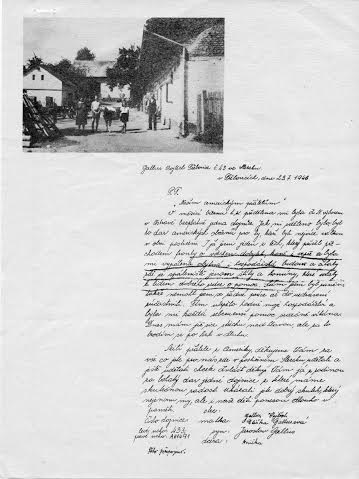 175 of the heifers were gifts of American Christians sent by the Heifer Project for the neediest farmers in Upper Silesia. The remainder were sent by the United Nations Relief and Rehabilitation Administration which made numerous shipments of horses and heifers to Czechoslovakia and Poland in 1945 to 1947. 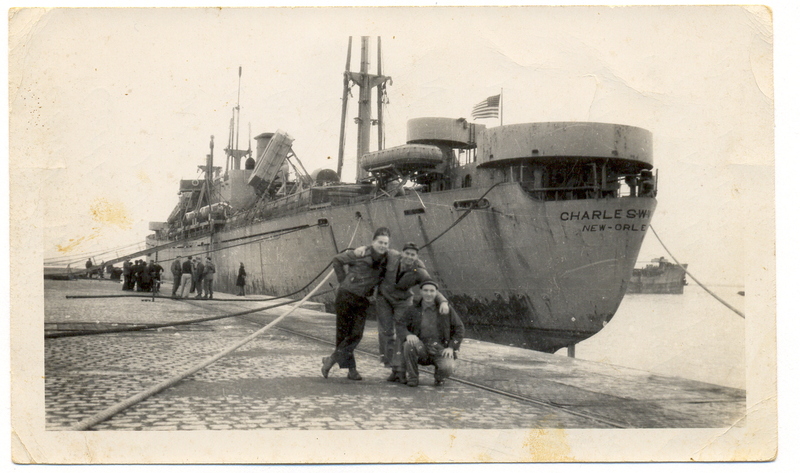 The S.S. Charles W. Wooster docked in Bremen, Germany, to offload heifers to be sent to Czechoslovakia in January 1946. Photo credit: Christian Kennel. This week, in Ratingen, Germany, the Upper Silesia Museum (Oberschlesisches Landesmuseum) has opened an exhibit, “For Body and Soul: from the culture of food and drink,” in which this history is remembered. One of the topics covered in the exhibition is strategies of providing nourishment in times of shortage and crisis, and it’s in that context that the seagoing cowboys and the Heifer Project are being introduced to museum goers. It has been my pleasure and privilege to provide the museum with the images to tell this piece of their history. Seagoing cowboy display at the Upper Silesia Museum, Ratingen, Germany. Photo courtesy of Oberschlesisches Landesmuseum. Heifer Project brochures on display at the Upper Silesia Museum. Photo courtesy of Oberschesisches Landesmuseum. The exhibit runs through October 15, 2016, so if you’re in Germany between now and then, stop in and take a look! 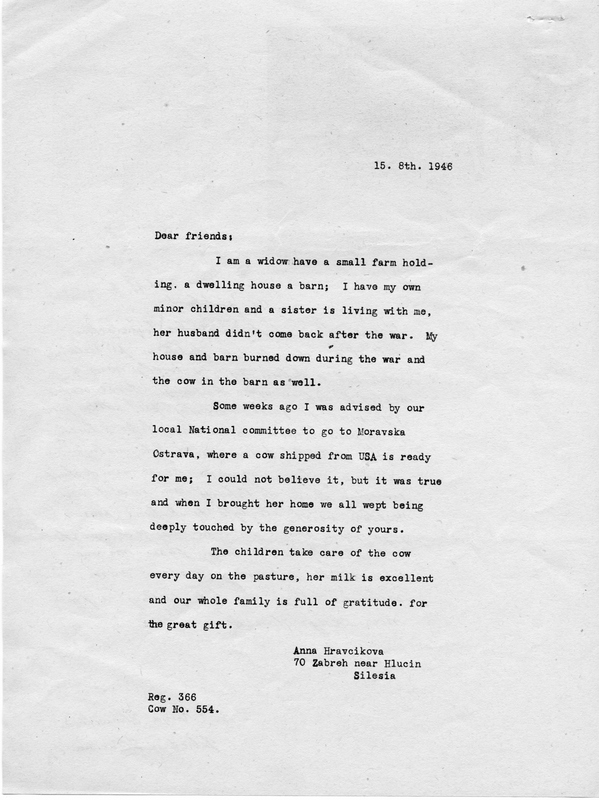 A recipient expresses thanks for their heifer. Courtesy of Heifer International. Thank you letter translation. Courtesy of Heifer International.. I grew up on a small dairy farm in northwestern Illinois, went to a small country church, attended a small high school, then a small church-related college before venturing out into the big, wide world. I applied my liberal arts education to a number of jobs and careers for 35 years before hitting my stride as the writer and caretaker of the seagoing cowboy history. This calling has kept me well occupied since 2002.